Share the post "The path of the Orthodox tradition"
The journey of Odysseus symbolizes the quest for self, the twelve steps have an initiatory value as the twelve labours of Hercules represent the quest for the ‘self’ to the ‘self’ through the obstacles encountered on the path toward oneself. It is through these myths that man realizes himself. It is a YOGA. Making emptiness, finding absence, in order to find Presence… meeting heaven in Earth. In the Orthodox tradition, it is experience that matters, it is by the sensorial and emotional feeling that meeting occurs and not through a theory or a religious ideology. “To see oneself in someone else and in the loved”. Tradition, is a “charismatic” experience, it’s meaning is the one of the word communion; it is not just a historical memory of the words. All Orthodox churches claim according to the tradition of a foundation dating back to the first century of our era. 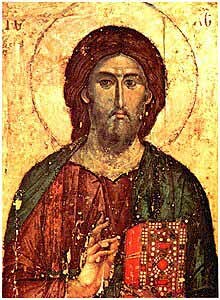 As the Hindu tradition is faithful to the Veda, the tradition of the Orthodox churches is faithful to the Gospel, to the teaching of the Apostles, to faith, to prayer, to the Tradition. This ‘Tradition’ relies on witnesses, called here Fathers of the Church, Fathers of the desert, and instructors of monastic life because their asceticism and spiritual lives are eminently doctrinal. They are like the Rishi (s) in ancient India with all the strength brought from ascetic experience and from the experience of the divine gained through prayer. They are the ones who, as the Yogi, embody, make live and flourish from generation to generation, the path, the road, in their own lives and transmit all there strength. The vocation of the desert passes through Mount Sinai, Mount Athos and the monasteries of the Meteors. Mount Sinai (Moses mountain) houses the Monastery St. Catherine of Sinai, also called Monastery of the Transfiguration, which attracts many pilgrims. To go to the Summit of Mount Sinai, take Siket Sayidna Musa, which enters the ravine behind the monastery “the route the 3750 steps of penance”. Mount Athos (the Holy Mountain) brings together twenty monasteries which support about 2 000 Orthodox monks and other searchers of truth in a mountain landscape also called “Christian Tibet”. To stay on Mount Athos: it is necessary to obtain a permit (the famous “diamonitirion”). To get it, make a demand addressed to the Office in Thessaloniki pilgrims, “Grafio Proskikiton 109 rue Egnatia – 54622 Thessaloniki Greece”. Give your desired date to visit Mount Athos. You can write, send a fax (00 30 2310 222424), email (pilgrimsbureau@c-lab.gr), or call (00 30 2310 252578). The easiest is to telephone. The monasteries of the Meteors or the monasteries hanging from the sky (Μετέωρα Μοναστήρια). Athanase the Great is the founder of the Monastery of Transfiguration or Monastery of the Great Meteor. Today only six monasteries are still active. while the guard of the inside is the fruit. will be cut down and thrown into the fire. This will be the teaching of the masters of hesychasm: they will never cease to recommend first and foremost to be attentive to oneself, to enter one’s heart; or, in the words of Saint Jean Climaque, «to aspire to circumscribe the intangible (spirit) in the body “, instead of letting it (the intangible) disperse outside. This is what we call Pratyahara and Dhāraṇā in the asceticism of yoga. The first – the retreat into solitude and silence, far from all worldly fuss. The second – to life in retirement, hesychast tradition added later the practice of a determined body posture and some control of the respiration. This is what we call Āsana and Prāṇāyāma in Yoga. In the philosophy and basic practice, there is virtually no difference between an ascetic Hindu and the approach to God in the Orthodox way. It is through the asceticism of the body, the respiratory control and control of the mind through the repetition of a mantra that we succeed in the Ultimate. You can read the excellent article by Jacques Vigne, titled “ Non-dualité et Mystique Chrétienne,” Vedanta and hesychasm, published in Question de n° 99 et 100 (1995).. This text is a study on Christianity and Hinduism, especially the hesychasm, i.e. the mystique of the Fathers of the desert, and of the Vedanta. This entry was posted in Areas of interest in Greece and tagged Apostles, ascetic experience, asceticism, faith, fathers of the Church, fathers of the desert, Gospel, Hindu tradition, India, instructors, Meteor monasteries, monastic life, Mount Athos, Mount Sinai, Orthodox, Orthodox churches, prayer, Rishi, spiritual life, the charismatic Presence, The path, tradition, Veda, witnesses, yogi on 6 June 2016 by Jean-Claude Garnier.